Feel amazing atmosphere during this 8 days surf camp in California. You will surf every morning and afternoon in a perfect location since the personal guide will find you the perfect waves suitable with your level. Rest your bones after a long day surf in a comfortable accommodation. Book now and create an unforgettable experience surfing in California with La Vague Surf Experience. You will be accommodated for 7 nights at a guest house located in down town San Clemente. La Vague Surf Experience tailors each outing to match the your ability and expectations. The goal is to offer a full package to enable you to enjoy the Californian lifestyle, even if you are only coming for a short trip. La Vague Surf Experience will work with you to help you make the most of your time to provide you with an unforgettable experience. Grégory Closier is the owner of La Vague Surf Experience and has more than 20 years of surfing, paddling, and coaching experience. Greg has traveled the world and surf perfect waves in exotic locations such as Indonesia, Hawaii, Morocco, Australia, Mexico, Portugal, Reunion Island and much more. Driven by the desire to share his passion for ocean sports with others, Greg succesfully earned a certificate in sport teaching and obtained the prestigious French surf instructor certificate from the French Surfing Federation. This surf camp will take place in San Clemente, California, USA. Known for its beauty and ocean culture, San Clemente is a quintessential Southern California beach community. San Clemente is a highly sought after California surfing destination steeped in the ubiquitous good vibes synonymous with the California surf lifestyle. Renown nearby surfing locations include San Onofre which is a SUP surfing mecca and Lower Trestles which known for high-performance short boarding. 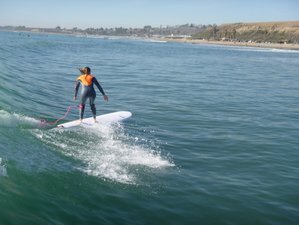 San Clemente boasts a high concentration of surfboard shapers and manufacturers, to include well established brands such as Noll Surfboards, Lost, Stewart, Timmy Patterson, Terry Senate, and Dewey Weber. The town is also the home of multiple world-class surfing legends, such as Shane Beschen, Kolohe Andino and many others who enjoy the location’s consistent, year-round swell. A reservation requires a deposit of 20% of the total price. La Vague Surf Experience offers clients a range of services suitable for beginners to experienced ocean athletes looking to refine their skills. For this organizer you can guarantee your booking through BookSurfCamps.com. All major credit cards supported. I would like to receive the BookSurfCamps email newsletter, including special Surf Camps offers and giveaways. Show this Surf Camp to your friends.